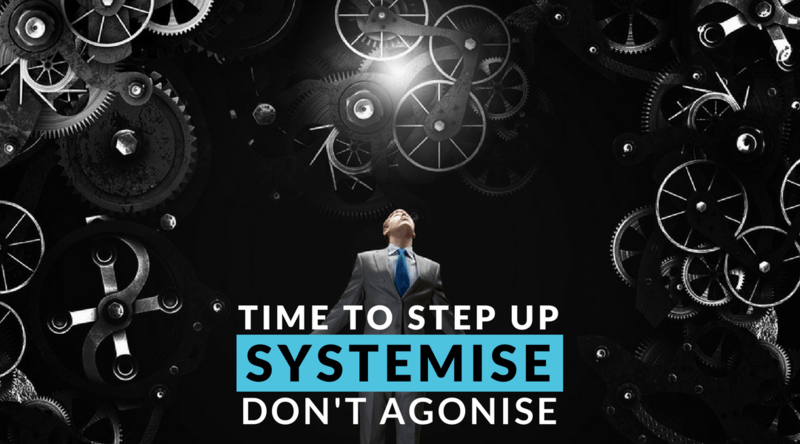 Time to Step Up - Systemise Don't Agonise - Organising Works! So your business is ticking along, but you know things could be better, much better. Every business experiences challenges at some time, mistakes happen, and sales fluctuate, these types of things are typical in any business. But what if this is happening more frequently. Problems can creep up rather quickly especially when you are routinely in crisis mode and, you are being dragged in a million directions. You may have noticed deadline creep, quality checks falling through the gaps or a team member just not cutting it. We need to be able to identify where the frustrations are to begin addressing them. When there are consistent frustrations in business, we can usually address them by putting systems in place that fix the issue and produce better results. Is your business working efficiently? Are you confident that you and your team have processes that are repeatable to the same standard every time? Do you have a process to monitor the quality of your product or service? Do your team members know their key responsibilities and what standard is expected of them? Do you have your knowledge and that of your key team members documented for training and delegation purposes? Do you have documentation that explains your businesses purpose, culture and objectives? Do you have documented policies, processes and work instructions? Do you have a systematic way of getting leads into your business? Do you have a proven system to convert prospects into buying customers? Is your sales process providing you with consistent results and a stream of customers? If you are a service business, do you create a great impression when bringing on a new client? Are new team members taken through a structured induction process? If the answer to the majority of these questions is “no”, you are one of many business owners agonising over putting the necessary systems in place in your business. This is the part of the business that falls behind as the business starts to grow and more exciting activities take precedence. Also, systemisation is not a natural strength for most people. As a business owner, you are busy, there are limited hours available to get through your task list, and your skills are being put to good use in moving your business forward. Could it be that your role in your business is becoming more of a job that that of a leader? If you have answered the above questions honestly, you will have heard the warning sirens. Could it be that your role in your business is becoming more of a job than that of a leader? It may well be that systemising your business is what you need to do to have the biggest impact on how your business is run, improving productivity, increasing the value of your business and lowering your stress. You may like to hear that you don’t have to face systemisation with that overwhelming feeling. Creating systems is most likely not your passion or skill set, but don’t let that prevent you from taking action. You can be the captain of the ship but that doesn’t mean that you have to be at the helm 24/7, others can take responsibility to relieve some of the burdens. You also don’t need to be the one who serves up all the meals, cleans away the dishes and plays piano in the lounge. If you were to be doing all these things, your crew and passengers would be concerned who is in taking charge of the ship and making vital decisions. Money spent on getting your business in order will be returned to you many times over with higher profits. If you are serious about putting systems in place, there are experts out there who love this stuff and do it every day (there’s a hint there). People who have systemised businesses before can get you to where you want to be faster without the aches and pains. Money spent on getting your business in order will be returned to you many times over with higher profits. As a result of systemisation, you’ll experience the likes of smoother client onboarding, less staff turnover, more engaged team members, less waste and mistakes and greater personal empowerment. Don’t agonise over the decision that will transform your business. If you haven’t figured it out already, I’m an expert at this stuff. Don’t agonise over the decision that will transform your business. Pick up the phone or get typing, tell me about what’s happening in your business and what changes you want. I work with business owners who want to scale their business without doing all the work themselves. Book in a session to talk about how we can unlock the potential in your business.